The Olympic Games that begin in Beijing on Friday will provide surprises and memories that live on throughout the years to come. What is certain is that not all of these surprises will be welcomed by the Chinese government, or the international community. There is no reason to think the Games will be anything other than a wonderful spectacle that will be enjoyed by billions around the world. The People's Republic of China has employed massive amounts of money, time, energy and creativity to ensure this is the result. However, the fact is that the Olympics have their own way of providing memorable surprises and the most uplifting of results. Just as Olympic medals are the result of a mixture of talent, sheer hard work and luck, a successful Olympics is not just the product of meticulous planning and goodwill on the part of the citizens of the host nation, but also depends upon the absence of international boycotts and political point scoring. Although there will be no substantial boycott of the Beijing Olympics, apart from perhaps a few non-attendees at the opening ceremony, the Chinese government has realised that holding the Games has not been without cost. While the successful bid to host the Olympics bolstered national pride within China, it also brought with it hitherto unexpected engagement with large numbers of international communities, ranging from human rights protestors to cyber activists. 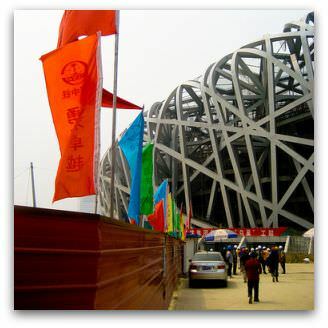 It is clear that the Beijing Olympics has already been a great example of what is known as the law of unexpected consequences, and these unexpected consequences will continue to accrue over the next few weeks, even as other memorable Olympic moments unfold. The torch relay has been one such example of an event with unexpected consequences. It is also a salient example of how such consequences exert their influence on more than just the Chinese government and populace at large. For instance, activists and protestors around the world welcomed the relay as an opportunity to raise a number of concerns about the political situation in China and sought to use this occasion to bring these issues to a broader international consciousness. Campaigners who lined the torch routes in major cities throughout the world included people flying banners promoting animal rights in China, protesting the treatment of Falun Gong practitioners and raising the question of Tibetan and Taiwanese independence. Largely through peaceful and even theatrical means these campaigners managed to achieve international attention for their concerns and were able to dominate the media cycle in previously unobtainable ways. Yet the unexpected consequence of all this coverage was not the successful attainment of these disparate goals — although international consciousness was raised through the campaigners' efforts — but rather a hardening of Chinese chauvinism. Whereas there was the beginning of a certain natural alliance between the general human rights concerns of the international protestors and the aspirations of the large middle class in China who are seeking greater personal autonomy and an amelioration of such things as internet censorship, the vociferous torch protests succeeded in driving a wedge between such groups. Rather than creating one world sharing one dream, to paraphrase the Olympic motto, the protests had the unexpected consequence of strengthening an aggressive Chinese nationalism. The Chinese people have swung behind the Chinese government, and its Olympic aspirations, because the motley mob haranguing the 'sacred torch' was perceived as having attacked China. Natural allies became alienated patriots. There will certainly be more such surprising consequences in the weeks to come. As the medal tallies grow, issues such as pollution, transport, religious practice and international relations will feature their own prime time moments — interesting viewing indeed. involves making bridges between Chinese Catholic communities and the universal church. In 2007-2008 he was a Visiting Lecturer in the History Department at Boston College, USA. He will return there as a post-doctoral researcher in 2009. I thank Jeremy Calrke for his article "Chinese burn for 'political' Games". The true spirit of the Olympic Games has now been tainted forever by allowing China’s authoritarian regime to host this prestigious sporting event. The IOC ignored the lessons of the 1936 Berlin Games, and awarding the Games to Beijing simply contradicts the IOC charter stating that the goal of the Games “is to place sport at the service of the harmonious development of man, with a view to promoting a peaceful society concerned with the preservation of human dignity”. Human rights groups have confirmed that the situation in China is far worse now in the lead up to the Games as the Chinese Communist Party uses the excuse of “maintaining social order” to intensify their crackdown. Thousands of minorities and human rights defenders are being arrested, Falun Gong practitioners continue to be jailed without trial and tortured, Christian denominations are suppressed and countless lives are being torn apart under a regime where public executions still exist, where forced abortions are rife, where all internet users remain monitored, where there is no rule of law, no freedom of the press, no freedom of religion or belief and no basic rights for individuals. Behind all of the trappings and sporting fervour, the Olympic Games sadly masks the daily suffering of millions of innocent Chinese citizens. Indeed. This will be an Olympics with the backdrop of political overtones. As the world comes to see all the rules and regulations in place, perhaps it may lead to a more open country. Thanks. An insightful comment and much-needed guidance on the impact of legitimate protest. Yes, the unexpected consequences will be indeed very great. Thanks. Politics is never far from the surface at the Olympics. Even at the so-called friendly Games in Melbourne in 1956, the famous 'Blood in the Water' water-polo match reflected tensions surrounding the Soviet invasion of Hungary ten days before.